So, where were you when it happened? I’m talking about the event of the year (so far) in mobile land, Google Earth. Mobilegeddon. If you missed it, then you might want to check out my last article on how to survive Mobilegeddon. It’s still not too late to make some changes to your site if you want to catch up. First of all I would like to say thank you to Google; your update is nothing short of genius. Yes it might mean that websites need to put in effort to be more mobile savvy now, but in the long run Google is just preparing us for the mobile takeover that is happening right in front of our noses. 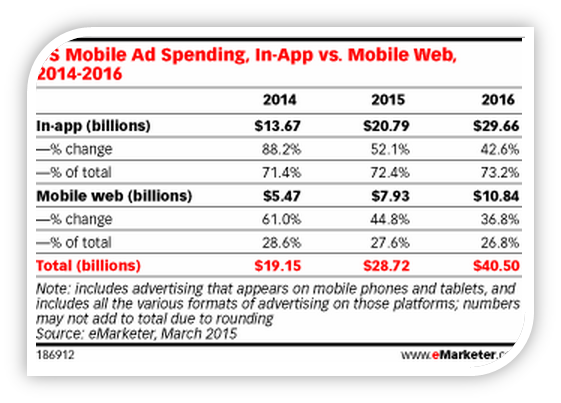 So what does this update mean for mobile advertising? According to new research about consumer behavior, we are all going to be spending over $53.3 billion via our mobile devices by the year 2024. This is a huge leap compared to the $9.7 billion we spend today. If this is the forecast for consumers, the impact on advertising strategies is huge. If you feel a bit behind with mobile ad effectiveness, I recommend this webinar as a place to start. eMarketer Webinar: Mobile Ad Effectiveness from eMarketer on Vimeo. Almost a week after Mobilegeddon, I wanted to put out three predictions about mobile advertising and where I see it heading in the near future. 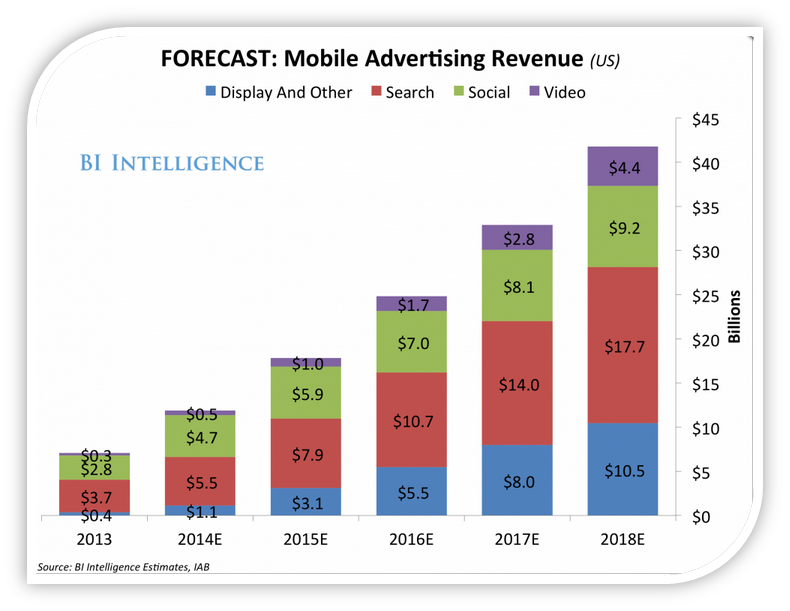 It’s already estimated that mobile advertising spending will reach $41 billion by 2017 and that’s less than two years away. Like with the Google update, whether you are a publisher or advertiser you need to start preparing now for the new mobile era. The nature of a mobile is movement, therefore it’s not hard to see why mobile video is going to play such an important role in digital advertising.Business Insider have estimated that by 2018, video ad revenue in the US will reach $4.4 billion. My prediction for the mobile video generation is that we will see much more interactive advertisements that will not just display at the beginning of a video, but also compliment content that is shown. So if you have a restaurant, your ads will be displayed on food related videos and so on. The more tailored your ad is, the more effective your campaign is going to be. This is where the programmatic approach starts to evolve and be noticed. If you want to know more about what this data driven method of automating your advertising bidding process, you should check out our in-depth guide Programmatic Advertising in a Nutshell – we just released the third installment that explains all about targeting your audience. There is no denying it, mobile users have countless apps that they use on a daily basis and spend more time in the app than they do on the mobile web browser. I can’t argue, my apps give me a much better experience as a user when on my mobile. My prediction is that as more digital publications catch on to the app trend and have their own developed, in-app advertisements will increase. Budgets for this trend are already set for rapid growth; eMarker have projected the amount to triple the mobile web spend for advertisers next year. To complement the increase of in-app ads, you are also likely to see the increase in app promotion. This method will help attract users to download your app and have instant access to your content from their mobiles. By investing in this type of promotions you can acquire and retain users in the long run. Once you hook your audience to download your app, it’s likely that they will keep coming back rather than look around. Remember mobile users want things fast, they don’t fit in the description of ‘browsers’ anymore. This is my personal favorite – I am a sucker for adverts that show me offers that are in my area. I think it’s incredibly clever if my favorite coffee shop (which I have the app for) knows I’m in the area and can send me either direct or indirect advertising that tell me I can get a discounted Mocha. Yes, I want one please. 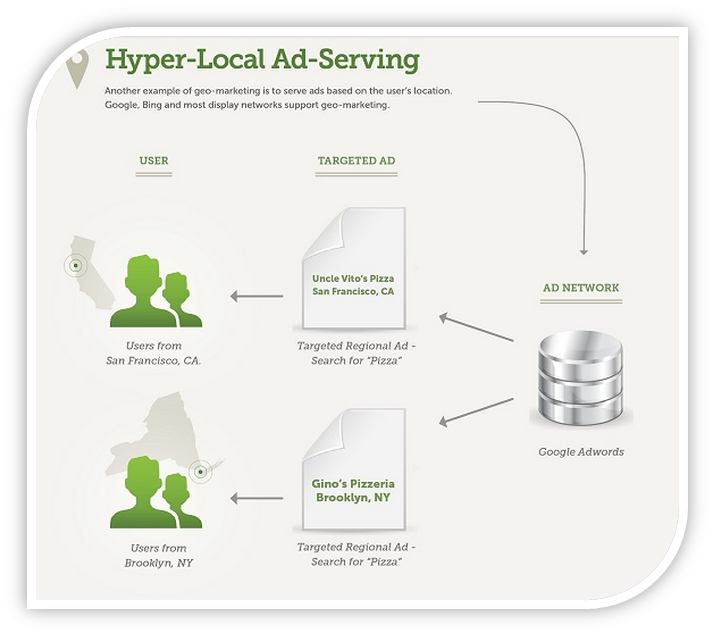 Localized advertising is becoming more popular with advertisers as it allows you to hyper target your audience and increase your ROI. The effectiveness of location based technology is deeply related to culture, language and being able to recognize when there is a preferred language no matter where the location. This prediction is also my hope for advertising. Show me the things that are relevant to me and are accessible in my location. And on the way, instead of isolating people in their mobile world, get users more engaged in the businesses around them. Happy economy means happy people. So what do you think about these predictions? Is this something you have been thinking about or is there something else that I missed?